But still all the same I am thankful. Most of all this year, I am thankful for my ability to be able to craft and for all of the wonderful people I've met through craft world. It's been a great year, and I hope next year I have even more to be thankful for! Being done with court reporting school would be really great! haha I hope everyone had a wonderful Thanksgiving. I know that I did! Okay.. so, I know that I've been a wee bit neglectful of my blogging over the past week. No more of that! I have been very busy, though. Recently I stitched up two more things for Tea Towel Tour 4 on Craftster. One of them I'm very happy with.. the other not so much lol... but we'll just skip over that now! For those of you who aren't familiar with the Tea Towel Tour... several people are broken up into groups of about five people and then a sort of Round Robin commences. Each person stitches on everyone in their group's towel. In the end you have a beautiful towel riddled with unique, gorgeous stitches! It really is a lot of fun to do and to watch as your towel progresses. You can check Tea Towel Tour 4 out here! be prepared.. there are tons of pictures to look at.. as of today 98 pages! So, here is one of the most recent things I've stitched for this tour. She's just a sweet little duck from a repro Martha's pattern. Luckily for me, the person I stitched it for is a fan of pastel colors... so, I really got to have fun with the color pallette! That would be me! I feel like such a dork because I'm soooo excited about something! I got my first blog award! I never expected one at all and so early on in my blog's lifespan.. yay! haha.. So, the incredibly sweet and talented Rachel of Cherry Tree Lane gave me the Kreativ Blog Award. She has a beautiful blog herself often featuring her adorable daughter, Kensington. Her recent post about decorating for the holidays had me yearning to break out all of my Christmas decorations and whip up a batch of fudge! Thanks so much for giving me this award, Rachel! -Link to the people you are passing it on to and leave them a comment to let them know. 1. Snuggling with my little dog, Angel.. especially when she nudges her head under my chin and into my neck.. so sweet! 2. Spending time with my Mom.. anything from talking on the phone to eating lunch or putting up wallpaper! 3. Going to the dog park with all of our dogs and playing in the evening when it's nice and cool. 4. Going to the dragraces with my dad.. especially when I'm getting to race. He always seems so proud of me then. 5. The incredible sense of accomplishment when I finish a sewing project.. whether it's a dress or Christmas ornament. 6. Embroidering.. especially while watching marathons on tv with Angel snuggled up beside me. Ya'll should definitely check out all of these bloggers. Every single one of their blogs is incredibly and always inspiring. Thanks again, Rachel, and everyone else who stops in to take a look at my little blog! Full of sweet sugary goodness, this little pink cottage is adorned with crochet lace curtains and lollipop architectural accents! You can find her on the prettiest street of a magical town.. Sugar Plum Lane. She's surrounded by satin ribbon trees and and springy glittery trees.. and you will always be able to find the sweetest little poodle here. This poodle is the gaurd of the pink cottage and never leaves its side. In this magical land soft glitzy snow always blankets the ground and snowflakes dance in the air. I hope you enjoy this little peek at Sugar Plum Lane! So, I've been working for a while now on several different little projects for the Christmas holidays. It is most definitely my favorite time of year. So, here are just a few of the projects I've been working on recently. There is much, much more to come! First up are a few of the ribbon trees that I've made so far. There are more, but this is a nice glimpse. I'm really proud of how they turned out. I just dreamed them up one day on a whim. I used the cones you find in the floral department of any craft store and then wrapped them, making pleats and pinning along the way, with various colors of satin ribbon. Then I adorned the tops and bottoms with paper flowers and buttons. This is a little paper mache deer that I painted with a light pink acrylic paint and then covered with a pink flocking powder. The texture is really beautiful in person but sort of difficult to photograph. I then adorned it with buttons and the most adorable aqua velvet ric rac. Some sweet little ric rac flowers. I had a lot of fun making these. I used the very simple tutorial located HERE at Knick Knacks & Ric Rac, a really fun blog. I have several new ric racs that I purchased recently.. so, there is most definetly more to come! I embroidered this little housewife recently for a towel on the Tea Towel Tour 4 on Craftster. She didn't turn out anything like I planned, but I'm still pretty happy with how she turned out altogether. 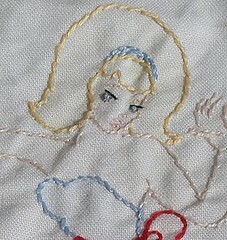 I based her off of a Sublime Stitching pattern.. the diner girl from the Krazy Kitchen Sublime Stitching pattern set. I modified almost the entire pattern, though.. everything from the hair to the dress and apron.. to her holding a pie rather than a tray. Sorry for the shabby picture.. I took it in a rush!